This design features a 2 tier cake frosted in “rainbow buttercream” customer’s choice 2 colors per tier with chefs choice mixture of candy. Shown as a 8″double stack. Note: Color choice is best if the colors go well together ie. pink/purple, blue/green, yellow/pink, orange/yellow. Available with 5 days notice, limited availability with 48 hours notice. 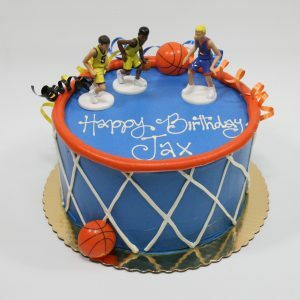 This design features customer’s choice 1 color frosting & 1 color rim with white detail of net. Players included depending on inventory. Shown as 4 layer 8″ with royal frosting & vibrant orange rim. Available with 5 days notice, Limited availability with 24 hours. 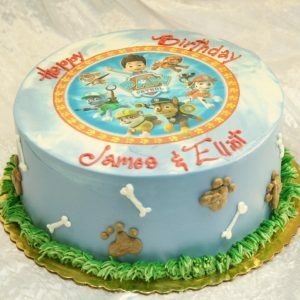 This cake features light royal buttercream with paw patrol image printed on marshmallow paper. Then detailed with buttercream grass, paws & bones along sides. Shown as a 8″ round. This design is available in all flavors with a minimum of 7 day’s notice. Limited flavors & sizes available in 24 hours. 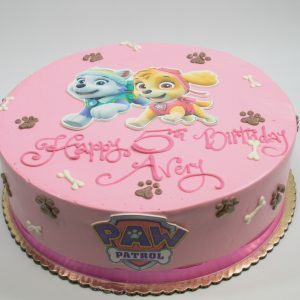 This cake features light pink buttercream with the girls of Paw Patrol, Skye & Everest! The image is printed on marshmallow paper and placed on rolled chocolate. Then detailed with buttercream paws & bones along sides. Shown as a 12″ round. Limited sizes & flavors with 4 days notice. 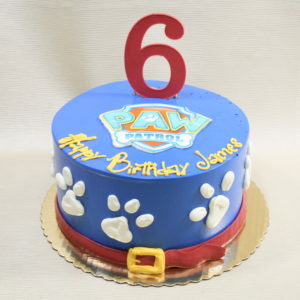 This design features an edible paper photo of the Paw Patrol logo in the center with customer’s choice single rolled chocolate propped number on top. There are hand-piped buttercream paw prints & dog collar bottom border. Shown as an 8″ round frosted in royal blue buttercream. This cake is designed to look like a large cupcake, for your little cupcake! 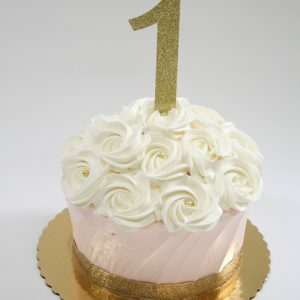 It features a blush colored frosting “wrapper” along the side, domed with vanilla buttercream and accented with gold dragees . Pricing includes customer’s choice of color wrapper with gold glitter ribbon along the bottom. Shown as a 6″ round , with glitter paper topper available at an additional charge. Available in all flavors with 7 day’s notice. 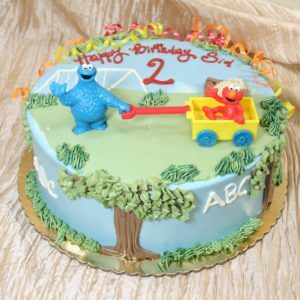 This design features a plastic Elmo & Cookie monster figurines on a buttercream playground. Shown as an 8″ round. This design is available in all flavors with 5 day’s notice. 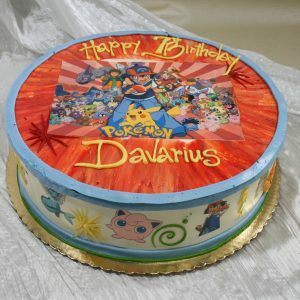 This design has all of your favorite Pokemon characters, in a colorful, fun, design! Photos are printed on edible marshmallow paper, applied to vanilla buttercream frosting..
Limited sizes and flavors with minimum 48 hours notice. 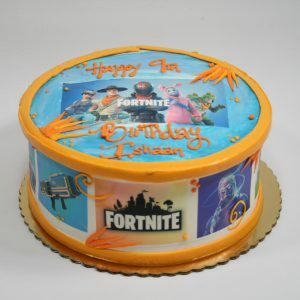 Design features the popular game Fortnite images on edible marshmallow paper. 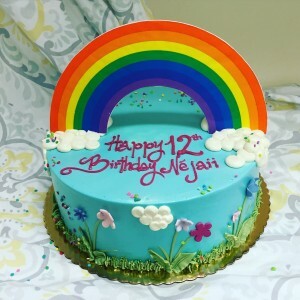 This cake is finished in vanilla buttercream frosting. Limited sizes and flavors with minimum 24 hours notice. 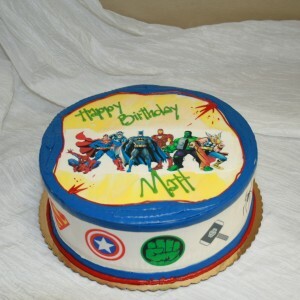 Design features Spiderman, Superman, Batman, The Hulk, Thor, Iron man, & Captain America on edible marshmallow paper. This cake is finished in vanilla buttercream frosting. 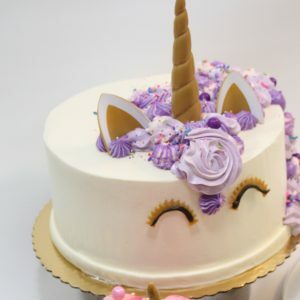 This Unicorn design is perfect for someone on a budget or your last minute order! This design is best on a 6″ or 8″ or 10″ only, if larger size is needed, a 2 tier is suggested. 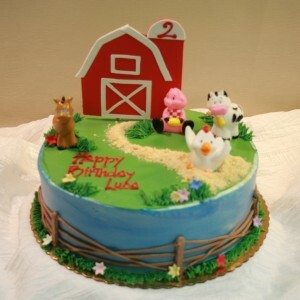 This design features plastic barnyard animals playing in a buttercream outdoor scene. On the top of the cake, there is a propped rolled chocolate barn. Shown as an 10″ round with a hand-piped fence around the side. This design is available in all flavors with a minimum of 7 day’s notice. Limited flavors & sizes order by Wednesday for the weekend. Design Level E. Recommend on an 8″ or larger. 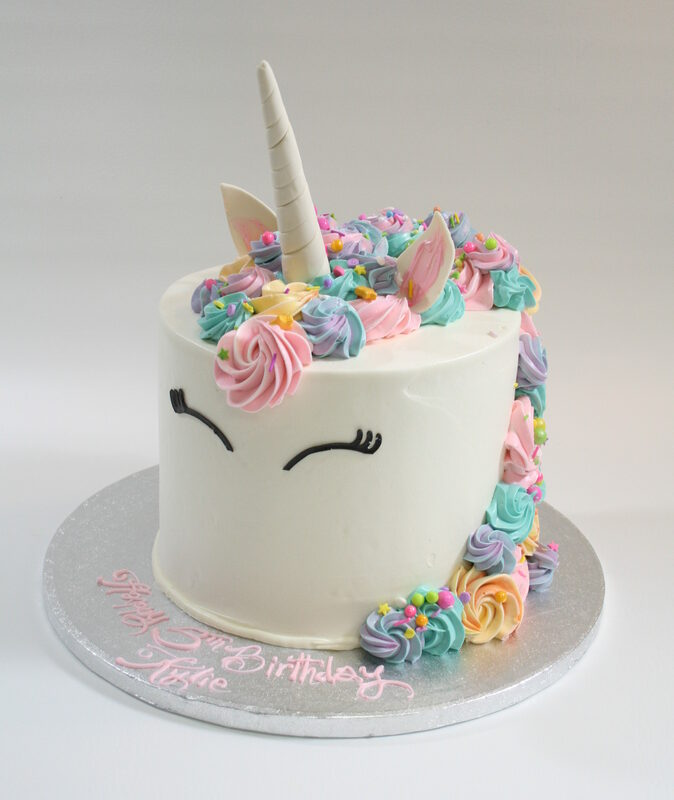 Our popular Unicorn design features vanilla buttercream frosting & Ombre pastel buttercream mane in pink, lavender, blue & yellow. The horn, ears & eyes are handmade from rolled chocolate. 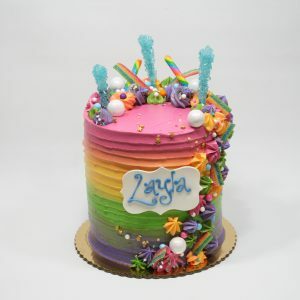 Other sizes are available, however we feel the design is best on a 6″ or 8″ or 10″ single tier only, if more servings needed, we recommend a 2 tier or double stack….main photo example size is an 8″ standard. Limited flavors & sizes order by Wednesday for the weekend. 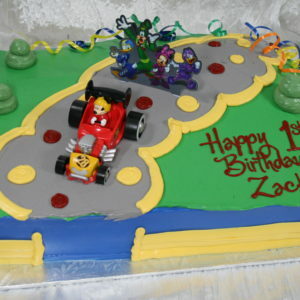 This scene includes a plastic figurine of Mickey driving down a sloped buttercream road out of Mickey Park. This design is available in all flavors & sizes with at least 5 day’s notice. 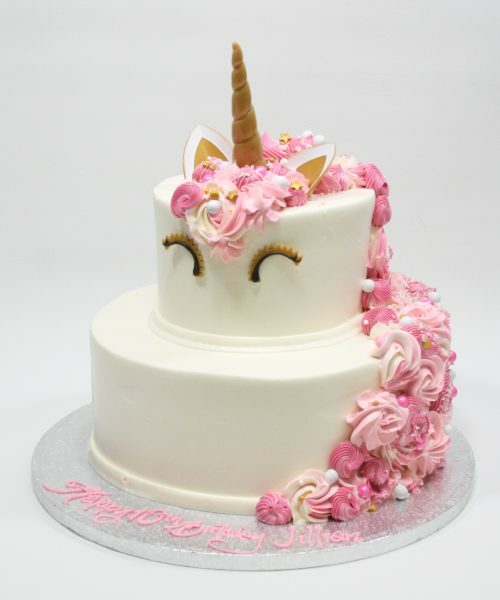 We Recommend this design be done on an 8″ sized cake or larger. This cake features customers choice 1 color frosting and chefs choice border. 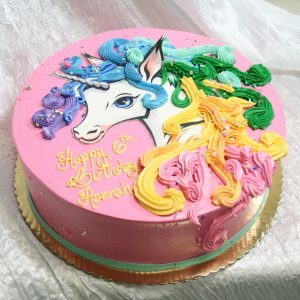 A unicorn image printed on rolled chocolate and detailed with rainbow hair. Shown as a 10″ round. Image what you can do with design concept!! 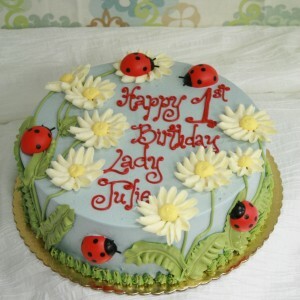 Pricing includes customer’s choice of (2) colors for the rolled chocolate polka dots & number, with other “standard” decorations such as : strawberries, chocolate adornments or buttercream flowers on your choice of chocolate or vanilla buttercream frosting. 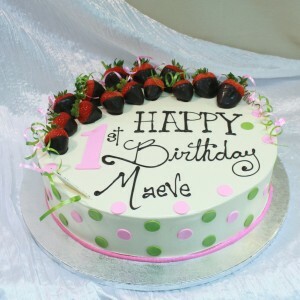 This design features rolled chocolate polka dots in pink & lime green on the sides with a large number 1 on top. 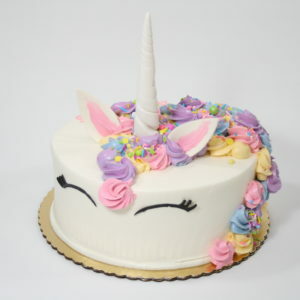 Shown as a 14″ round frosted in vanilla buttercream, with a crescent of chocolate dipped strawberries.